Diary of a Wimpy Kid: Dog Days is a 2012 American comedy film directed by David Bowers from a screenplay by Wallace Wolodarsky and Maya Forbes. It stars Zachary Gordon and Steve Zahn. Robert Capron, Devon Bostick, Rachael Harris, Peyton List, Grayson Russell, and Karan Brar also have prominent roles. It is the third installment in the Diary of a Wimpy Kid film series, and is a combination of elements from the third and fourth books in the series, but draws mostly from the fourth book. The film was released on August 3, 2012 by 20th Century Fox. and earned $77.1 million on a $22 million budget. Diary of a Wimpy Kid: Dog Days is also the last film in the series to feature the original cast members, as many of the cast (such as Zachary Gordon, Robert Capron and Devon Bostick) outgrew their roles and new actors were cast for the subsequent films in the series, starting with Diary of a Wimpy Kid: The Long Haul, which was released five years later. It also features the final film role of Alf Humphreys before his death in 2018. The Heffley family attends a pool party at the community pool, where the family meets Lenwood Heath, a former trouble-making friend of Rodrick who is now a model student after attending a prep school known as Spag Union. Greg's father Frank thinks about enrolling Greg there. Greg's summer vacation starts off badly: Frank bans video games in anger at Greg's laziness, and his mother Susan starts a book club for all the boys in the neighborhood, but she does not see their books as real literature causing the boys to never come back the next day. Frank is also getting jealous of the neighbor's athletic kids, and after his video game ban, Susan forces Frank and Greg to bond with each other: their bonding activities end in disaster. A few weeks later, Greg's best friend, Rowley Jefferson, takes Greg to the local country club, where his family are members of. Greg enjoys the lifestyle there and the fact that his crush, Holly Hills, teaches tennis there and he doesn't have to go to the book club. Greg returns home to learn that Frank signed him up for an unpaid summer internship at his work without his consent, and Greg lies about having a job at the country club. Frank and Susan are delighted, and give him a starter cell phone, a Ladybug, which only allows him to call home or 911. Later, Rowley invites Greg on a family trip to their beach house near the Boardwalk, but Greg finds the lifestyle banal and attempts to escape. He e-mails Susan and tries to call home using his Ladybug phone, but the phone rejects the call, and after he inadvertently calls 911, the police arrive, almost leading to the arrest of Rowley's father (after making the mistake of bringing a bread knife to the door), who sends home Greg in anger. Rowley doesn't allow Greg to tag along with him to the country club because of the beach house incident, but Greg sneaks in, meets up with Holly and her sister Heather and manages to get Rodrick's band Löded Diper a gig at Heather's Sweet 16 birthday party, much to Rodrick's delight. Rowley and Greg quickly make up, but Rowley is unable to attend the club, forcing Greg to sneak in again. One morning, Frank drops Greg off, only to be confronted by Rowley's father: Greg has built up a $260 fruit smoothie bill from his time at the country club. When Frank attempts to explain the situation, the clerk informs him that the club does not employ minors, and Greg is exposed. As a result, when he receives a Spag Union disc in the mail, he fears he will be sent there. Rodrick informs Greg that a "Wilderness Weekend" event could be a way to avoid Spag Union. Their troop proves weak compared to Frank's boss, Stan's, troop. After a Camp story, Greg continues to mess things up and Frank tells him that everyone messes up. After the boys overhear Stan and his troop insulting Frank, Greg attempts to set up a plan for revenge by using traps, and finds out that Stan's troop has been using electric and other appliances including pre-cooked meals and portable TV's rather than actually camping. Stan arrives at the tent, Greg manages to escape while Stan accidentally throws his own tent into the campfire, and Greg admits he was responsible but his friends tell him that he did it to defend his honor. Frank, having lost his respect for Stan, then confronts him with the electronic conveniences (although he was jealous of Stan throughout the movie), and Stan runs into Greg's trap, leaving him humiliated. Frank ends up revealing to Greg that he was never really all that into camping anyway, and decides not to send Greg to Spag Union, much to Greg's surprise and delight. As the father and son talk things over, Frank gives Greg advice on learning from your mistakes and taking responsibility for your actions, and the two of them ultimately realize that they're actually much more alike than they originally thought. A few days later, Löded Diper goes to Heather's Sweet 16 birthday party, where Rodrick performs a hard rock cover of "Baby" by Justin Bieber and Ludacris, attempting to impress Heather. However, Rodrick accidentally knocks over a huge ice sculpture of Heather, which results in her losing her temper and accidentally smashing a chocolate fountain with a microphone stand (while trying to hit Rodrick), splashing chocolate all over her and her friend Madison, and the party ends in disaster. Holly then implies that she likes Greg by holding his hand, and in the final scene, Greg, Holly, and Rowley all hang out together at the local pool. Greg admits that while his summer didn't go the way he expected, it was ultimately a pretty good summer and might be the best one ever. Principal photography began on August 8, 2011 in Vancouver and was completed on October 7, 2011. The location for the country club pool was Eagle Ridge Outdoor pool in Coquitlam, BC. Filming at Eagle Ridge Outdoor pool took place during the end of August 2011. The municipal outdoor pool scenes at the beginning and the end of the movie were filmed at Steveston Outdoor pool in Richmond, BC. Filming occurred at the Steveston Outdoor pool during the beginning of September 2011. The Chinese Bunkhouse at the Steveston Shipyards in Richmond, BC was the location of the Wilderness Explorers cabin for Troop 133. During filming, stars Zachary Gordon and Robert Capron, were seen riding the Corkscrew at Playland at Vancouver's fair, the PNE. Capron had to wear a wig for this movie, as his hair was shaved to play the role of Young Curly in The Three Stooges, as explained in The Wimpy Kid Movie Diary book. A poster was leaked in March 2012. A teaser trailer was attached to The Three Stooges. An advance screening for the film was held on July 31, 2012. On Rotten Tomatoes, a review aggregator, the film has an approval rating of 51% based on 71 reviews and an average rating of 5.5/10. The site's critical consensus reads, "Overly familiar and a bit too reliant on slapstick, the sitcom-like Dog Days fails to improve upon previous installments and will likely appeal to few outside its target audience." On Metacritic, the film has a score of 54 out of 100 based on 22 critics, indicating "mixed or average reviews". Audiences polled by CinemaScore gave the film an average grade of "A−" on an A+ to F scale. Abby West of Entertainment Weekly gave the film a B+ and wrote "Though often self-centered and conniving, Greg remains a likable kid, and the movie entertains by pulling off over-the-top scenarios that set up digestible life lessons for youngsters." OregonLive.com praised Zachary Gordon's acting, writing, "[h]is easy likeability and general relatability are perhaps two of the biggest keys to Diary of a Wimpy Kid: Dog Days." Matt Mueller of OnMilwaukee gave the movie a negative review, calling it "manic, forced, predictable, scatterbrained and often times unpleasant." Mueller criticized the movie's "overstuffed screenplay" for being "very attention-deficit, cramming in numerous wacky plot elements, most of them solely existing for predictable jokes that were met in my screening with interminable silence." He wrote that "[s]ome of the storylines could've made for decent movies on their own," particularly the one where Greg joins the Boy Scouts, but that they were only brought back "when the screenplay needs another forced comic set piece or ill-fated attempt at wringing unearned emotion." Mueller disliked Greg's behavior, writing "He's lazy and wildly selfish, taking advantage of his friend's unbridled kindness. His trip with Rowley's family ends with Greg insulting the entire clan and getting the dad arrested by the police. Later in the film, he runs up the family's bill sneaking into the country club. What part of this behavior is charming?" The review concludes with Mueller writing, "In Dog Days' lone earnest moment, Rowley astutely explains that his parents' disappointment is worse than their yelling. In that case, I'm not angry that a movie like this can take the joys of childhood and make them so joyless and unpleasant. I'm disappointed." 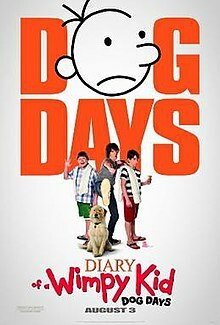 Diary of a Wimpy Kid: Dog Days was released on iTunes on December 4, 2012. It was released on DVD and Blu-ray in the United States on December 18, 2012. It was released on Redbox on January 15, 2013. An animated short film set after the events of Dog Days, Diary of a Wimpy Kid: Class Clown, was released on the home media release of Dog Days, with Zachary Gordon reprising his role as Greg Heffley, and archival audio of various other cast members from Dog Days covering the film. At the time of its release, Dog Days was described as the last live-action film in the franchise. In August 2012, while doing press for the film, Jeff Kinney, Zachary Gordon and Robert Capron each indicated that there were no plans for a fourth film, but did not dismiss the possibility entirely. Kinney replied to inquiries regarding the possibility of another sequel, stating, "At present, we don’t have a fourth film in development, but you never know!" And when describing the likelihood of starring in another film in the series, Gordon explained, "[Dog Days] most likely will be the last movie. The main problem is [the cast] is getting older. You can't stop it. There's no way to temporarily stop us from changing and growing up. You know, that's the problem because the characters are supposed to be timeless." In March 2013, Zachary Gordon stated in a Spreecast live stream that there would not be a fourth live-action film. Jeff Kinney has indicated that instead of doing a live-action film of the sixth novel Cabin Fever, he would like to see it adapted into an animated film, stating in an interview, "I hope that it gets made into an animated movie. I'd really like to see it turn into an animated television special." On July 29, 2016, it was announced that a new movie with a different cast based on the 9th book, The Long Haul, had begun production. The film was released on May 19, 2017. ^ a b c "Diary of a Wimpy Kid: Dog Days". AFI Catalog of Feature Films. Retrieved July 23, 2017. ^ Kaufman, Amy (2012-08-02). "'Total Recall' will fight 'Dark Knight Rises' for No. 1". latimes.com. Retrieved 2012-10-19. ^ "Diary of a Wimpy Kid: Dog Days (2012)". Box Office Mojo. Retrieved 13 April 2013. ^ "Third "Diary of a Wimpy Kid" movie starts filming". All Headline News. August 20, 2011. Retrieved August 10, 2011. ^ "Film List" (PDF). British Columbia Film Commission. August 9, 2011. Retrieved August 14, 2011. ^ "Diary of a Wimpy Kid filmed in Coquitlam". The NOW: Coquitlam, Port Coquitlam, Port Moody, Anmore and Belcarra. September 14, 2011. p. 13. Retrieved May 16, 2014. - The name of the film that caused the closure of Eagle Ridge Pool has been revealed: the third installment of the Diary of a Wimpy Kid movies is being filmed partially in Coquitlam. ^ "Coquitlam's Eagle Ridge Pool was recently transformed into a country club pool for scenes being filmed for the movie Diary of a Wimpy Kid: Dog Days". Flickr. October 1, 2011. p. 13. Retrieved May 16, 2014. ^ "Eagle Ridge Outdoor Pool". City of Coquitlam. Retrieved May 16, 2014. ^ "Filming in Steveston". Steveston Insider. October 10, 2011. Retrieved May 16, 2014. - Meanwhile, at the beginning of September, Steveston Pool became a very active and inviting pool party, filled with beach balls, pool floats and a snack shack, as a location for Diary of a Wimpy Kid 3. ^ "Film Industry Activities in Richmond - Steveston Area". Hansard, British Columbia Legislature. July 22, 2013. p. 814. Retrieved May 16, 2014. - ...and Steveston Outdoor Pool became the site of a pool party in Diary of a Wimpy Kid 3. ^ "Steveston Outdoor Pool". City of Richmond. p. 814. Retrieved May 16, 2014. .
^ a b Director's commentary from the Diary of a Wimpy Kid: Dog Days DVD. ^ "Britannia Shipyards National Historic Site". City of Richmond. Retrieved May 16, 2014. - ...the last surviving Chinese Bunk Houses on the Pacific Northwest Coast. ^ "Recently Classified Trailers, Commercials and PSAs". AlbertaFilmRaings.ca. Retrieved April 10, 2012. ^ "Diary of a Wimpy Kid: Dog Days". AdvanceScreenings.com. Retrieved June 27, 2012. ^ "Diary of a Wimpy Kid: Dog Days". Rotten Tomatoes. Retrieved 2013-01-28. ^ "Diary of a Wimpy Kid: Dog Days Reviews, Ratings, Credits, and More". Metacritic. Retrieved 2012-10-19. ^ Abby West (2012-08-10). "Diary of a Wimpy Kid: Dog Days review". EW.com. Retrieved 2012-10-19. ^ "'Diary of a Wimpy Kid' review: Summer of pre-teen social mayhem". OregonLive.com. 2012-06-03. Retrieved 2018-03-18. ^ Matt Mueller (2012-06-03). ""Diary of a Wimpy Kid: Dog Days" a dog indeed". OnMilwaukee. Retrieved 2018-03-24. ^ "Kids' Choice Awards 2013". Nick.com. Retrieved 31 March 2013. ^ "34th Annual Young Artist Awards". YoungArtistAwards.org. Retrieved 31 March 2013. ^ "iTunes - Movies - Diary of a Wimpy Kid: Dog Days". iTunes. Retrieved 4 October 2014. ^ "Diary of a Wimpy Kid: Dog Days (2012)". Amazon.com. Retrieved December 4, 2012. ^ "Diary of a Wimpy Kid: Dog Days". redbox.com. Retrieved 4 October 2014. ^ a b c "Zachary Gordon Talks "Diary of a Wimpy Kid: Dog Days"". ClevverTV. 7 August 2012. Retrieved 30 December 2012. ^ a b "Zachary Gordon & Robert Capron Interview - Diary of a Unwimpy Kid: Dog Days". HeyUGuysBlog. 3 August 2012. ^ a b Michael Cavna (3 August 2012). "Jeff Kinney on the challenges of his latest film, 'Dog Days'". The Washington Post. ^ Elise Jonas-Delson (21 November 2011). "Q&A: Jeff Kinney". TimeForKids.com. Retrieved 30 December 2012.